The November meeting is our last of the year (as Christmas tends to get in the way). As usual there was a lot of interesting discussion but a lot of activity as well. 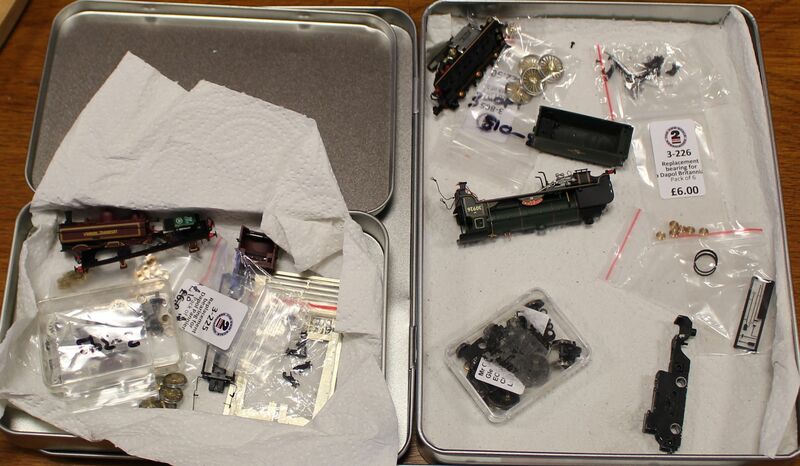 Nigel and I are working on converting a pair of Dapol Britannia 4-6-2s. That's Nigel's on the left, with standard Association bearings soldered into the Dapol bearings amd reusing the Dapol gears. Mine on the right will utilise the new Association bearings and gears from the shop. Taking the Brits apart was not easy and required glued joints to be broken. 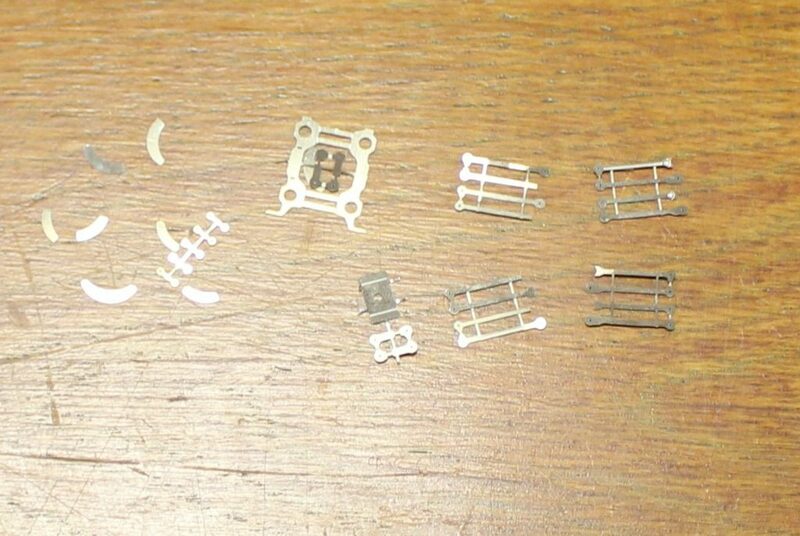 We have come up with some etched parts for the bogie, coupling rods (fluted and plain with the ability to have both as several locos did), balance weights, plus a couple of pieces which will hopefully allow us to utilise the majority of the Britannia valve gear. 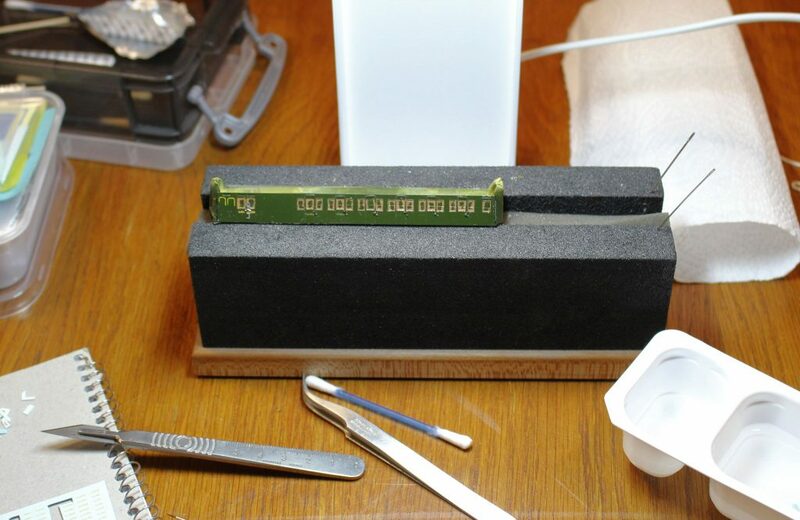 You can see the first test etches below (excuse the poor photograph - the light in the room is not the best). I am going to check the fit of the coupling rods and Nigel is checking the rest. If it all works we hope to do the same for the Schools. 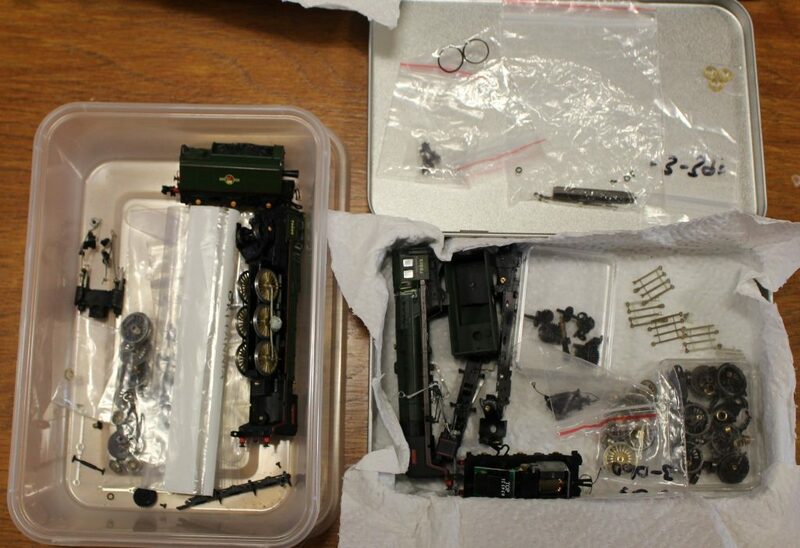 That's mine on the right below with the Dapol Pannier on the left (both also in pieces). Nigel also has a Schools to convert. The Brit and the Schools are both diversions for us as neither fits with our main projects, but this is a hobby and it does us good to do something different once in a while. The Schools came apart with much more grace. The bearings are the same diameter as those for the Pannier - they are longer but that is irrelevant to us - so I ordered an extra four for the Schools. 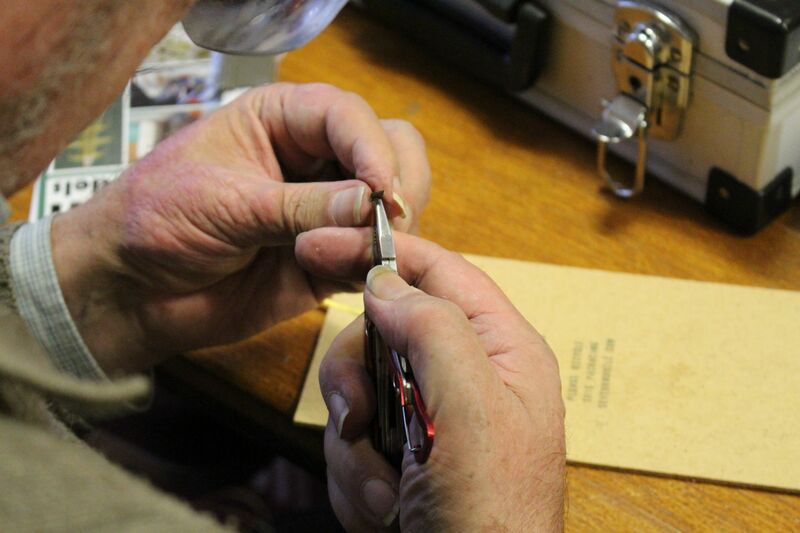 Alan was lining a Maunsell coach built from a Chis Higgs etched kit. Guy was building track, or rather re-building track due to a series of unfortunate incidents. 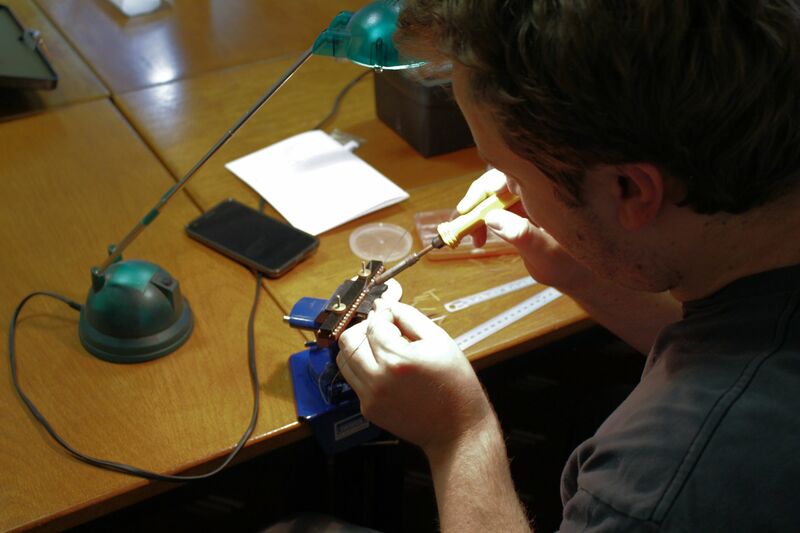 David was assembling DGs, here seen doing the most fiddly bit - fitting the tongue. 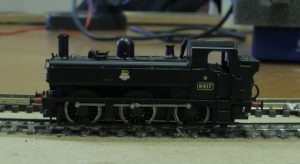 Nigel’s Farish 64XX converted using the new Association kit. An article on the conversion will appear in the magazine in due course. Nigel’s Ivatt 2MT mid way through it’s conversion. Nigel’s Western converted to 2FS by Nigel himself. Dave’s SR N Class is yet to be converted but was stretching it’s legs on the test track. Interesting that the Dapol Schools tender wheels seem to be mounted with the same principle as the Farish 4F etc ones. What are your plans for converting the tender? How has Nigel done the tender wheels for his 2MT? The tender wheels will be turned to 2FS standards (or as close as possible). I believe this is what Nigel did with the 2MT but he will no doubt correct me if I am wrong. Correction to this post - the Pannier bearings will NOT work for the Schools as the Schools chassis is considerably wider. The Schools bearing is also very slightly wider.